The world’s toughest and most waterproof motorcycle luggage system proven by thousands of adventure riders all over the world. 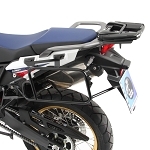 Fits 2017 and earlier Honda Africa Twin CRF1000L. Flexibility - Super strong Hepco Becker “Lock-It” side luggage racks offer the best fit. Remove the rack in a few short minutes leaving behind small unobtrusive attach plates. Regular racks also available.